None of the Big Three broadcast networks noted the release Friday of the Congressional Budget Office’s final determination of the fiscal year 2012 federal budget deficit: $1.1 trillion, the fourth year in a row of trillion-dollar deficits. ABC, CBS and NBC’s Friday evening newscasts and Saturday morning news programs were silent about the statistic — even though Obama’s massive spending and broken 2008 promise of halving the deficit are central issues of this year’s presidential campaign. A look back shows that the networks were also silent last year, when the deficit came in at $1.299 trillion for fiscal year 2011. In 2010, the networks skipped CBO’s October 7, 2010 report of a $1.3 trillion deficit, but later noted the final number when it was released by the Office of Management and Budget on October 15. You have to go back to 2009 (which saw a record $1.4 trillion deficit) to find a year when the three broadcast networks treated the government’s severely unbalanced budget as real news — and, even then, it was given not much more than a passing mention on ABC and NBC (with Katie Couric’s CBS Evening News waiting a week to play catch-up). While Congress has not passed a budget for the new fiscal year (2013) that began last Monday, the Obama White House has projected a deficit of more than $900 billion. If that’s at all close to the mark, the five years from FY2009 through FY2013 will have seen about $6 trillion in total deficits — huge news to everybody, it would seem, except for the broadcast news networks. The government's fiscal 2012 has now come to a close and the score is in. 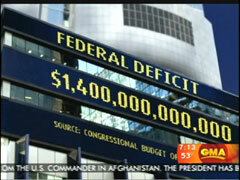 The budget deficit for 2012 was $1.1 trillion, the fourth year of trillion-dollar deficits under President Obama. The nonpartisan Congressional Budget Office said Friday that the $1.1 trillion shortfall, based on Treasury statements, was about $200 billion less than in fiscal 2011. But part of this difference is due to a timing shift that put some final payments in 2011 because Oct. 1, 2011 fell on a weekend. Without the assistance from the calendar, the deficit in 2012 would have been $30 billion larger than reported. The deficit has become a major issue in the presidential campaign. -- Rich Noyes is Research Director at the Media Research Center. Click here to follow him on Twitter.